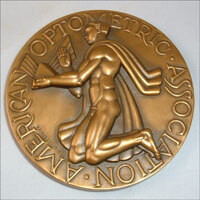 On June 10, 2010, Tom Sullivan was presented with the Apollo Award presented by American Optometry Association. The Apollo Award is the highest award presented to the general public by the American Optometric Association. It honors persons or organizations for distinguished service to the visual welfare of the public, and recipients have included educators and spokespersons, organizations such as service clubs and philanthropic groups, programs in schools and communities, and publications. Prior to 1961 the awards were known as “Distinguished Service Awards,” and through 1980 optometrists were eligible to receive the award.